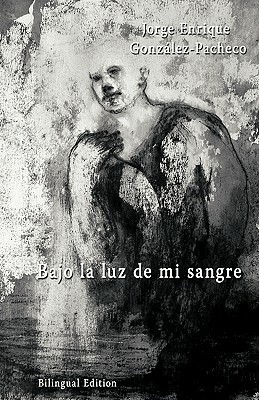 This Saturday, April 23 at 2pm we’ll welcome Cuban poet Jorge Enrique Gonzalez-Pacheco to read from his new collection, Bajo La Luz de Mi Sangre (Under the Light of My Blood.) This unique volume of poetry, printed in both Spanish and English, just received a fantastic review in The Latin American Review of Books. Jorge will be joined by special guest Eme Eldson. Together, they’ll read select poems from the book in both English and Spanish. Jorge was kind enough to send us a sneak peek of what he’ll be reading here this weekend. Today’s poem of the day his Habana. If you enjoy his style, be sure to stop by Saturday afternoon at 2pm. You’ll find the reading on our second floor. by harboring the anxiety in this fragile sea? the flame anchored in your colors. watercolor eyes of the city. chaste voice in a calm urge. A park, a cloud, summer, God. when the stars nurse your elusive chant. ~Born in the District of Marianao, Havana, Cuba on September 9, 1969, Jorge Enrique Gonzalez Pacheco is a Cuban poet and writer who now lives in the United States. He is the author of Poesia Ilustrada (New York, 1992 USA); Antologia de la Decima Cosmica de La Habana (Mexico D.F, 2003 Mexico); Notaciones del inocente (Moguer, 2003 Spain); Tierra de Secreta Transparencia (Madrid, 2004 Spain)—an anthology of poems by the Cuban poet Serafina Nunez—he wrote half of the prologue and did the selection of the poems. Since 1991 he has been publishing poetry and prose in magazines, anthologies, newspapers, and online publications in Cuba, Mexico, Puerto Rico, Chile, Argentina, Spain, France, Brazil, and the United States. At present he’s the Curator and Artistic Director of the Seattle International Latino Film Festival. In 1996 he received The Delia Carrera Poetry Prize, a national prize awarded in Cuba. The poems in Under the Light of my Blood seek to paint unsettling issues discovered in living memory, allowing them to awaken, like the life of the poet in Cuba, where Jorge Enrique was born. The texts become a search for identity, or an interior autobiography chronicling events that occurred between the poet’s birth and his exile. Poetry takes as its premise that language is a medium for experiencing experiences.